ibs Store manages the entire invoice control process (this process occurs after a receiving from a supplier or a distribution center). ibs Store enables the users to enter into the system the received invoices or the credit note. 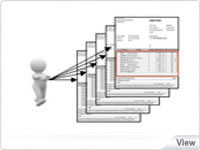 With ibs Store, the invoice matching can be done manually or by integration from another system. Dedicated users	or external systems are able to reconcile the invoice with the order number (from the suppliers or distribution) and the receiving note. ibs Store automatically generates the valuation of the receiving. Based on this, correction may be done during the Invoice Control process. 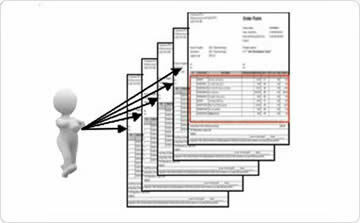 With ibs Storeusers pre-validate the invoice control according to predefined rules to accept a tolerance between the invoice and what has been	really received and the price agreed during the ordering. The application	of the tolerance threshold is totally configurable according to the products, the suppliers, and the amount generated. It helps users save time and work optimally..
Stocks are updated automatically(with correction on quantities or price). The payment authorization is launched. Payment and Terms are defined. Payment Management Service is informed and receives the information following this process. ibs Store autmatically calculates gaps (in quantity or in value) based on the invoice and the information of the business solution. If there is a discrepancy between the invoice and the order received (litigation on quantity) or the price agreed upon during the Ordering process (litigation on price), ibs Store automatically generates a credit request or invoice request. ibs Store automates the invoice control process to save time for the user for more added-value activities and prevents human-error. ibs Store allows users to follow-up payments, invoices account balances and credit account balances.